Now that we have reviewed all lone worker scenarios—indoors, outdoors, driving and remote—do you feel comfortable that your work-alone safety policy takes all of these scenarios into account? Do you have a manual check-in process in place or do you make use of a buddy system? Are your workers complacent or compliant? Whichever method you use to monitor the safety of your personnel, a work-alone safety policy it a critical tool that should be in place, maintained and communicated to your teams. It sets the standard and expectations of your teams, both within the workforce and management—the common goal is to help employees go home in the same condition they arrived to work. Although many companies still use manual check-in processes, are you aware of the amount of time wasted by lone workers halting duties to check-in every two hours (a common check-time)? The loss in productivity just might surprise you. Do you know the costs of a check-in system? A team of 100 employees, with a standard two-hour check-in process could lose $12,500, or more, every month in otherwise productive time. Is your organization willing to accept this cost? Below we make our case—see for yourself the impact of your traditional check-in system. 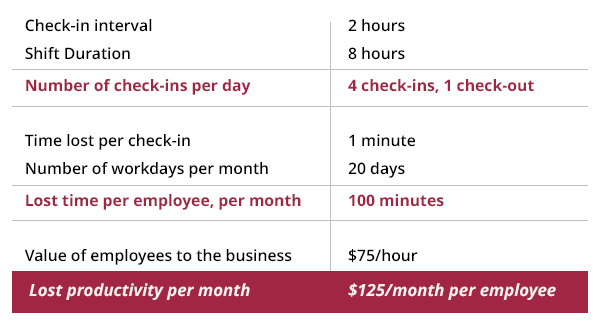 Will employees typically lose more than a minute of productivity for each check-in? We think so. Factor a third-party call center to administer the system and the overall program doubles in monthly expenses! Compared to a buddy system, the business case to justify a proactive and real-time safety monitoring solution is very straightforward. When two employees are working together and supporting the safety of each other, there is a natural inefficiency. Sometimes a job will require two people to carry out while at other times, buddies are there for each other’s safety and productivity is generated by only one person. This business inefficiency costs your company every month. If half of the tasks being handled are one-person jobs and those jobs produce half the productivity, your business could lose $6,000 per month in otherwise productive work. Blackline offers a better way to respond to lone workers who have suffered an occupational safety incident, health event or physical assault—we are with your team every step of the way. Unlike a manual check-in process that may take up to a couple hours to detect an incident, our technology acts in real-time. We empower your organization to respond in the fastest possible time—directly to your teammate’s precise location, regardless of where they are in the world. If a buddy is nearby, monitoring personnel can remotely alert them to provide quick assistance. Further, keeping your employees independent means that they will be available to respond to incidents that otherwise would have affected both members of a buddy team, such as a retaining wall collapsing, the rupturing of a vessel, or carbon monoxide exposure. Compared to a manual check-in and buddy system processes, our safety monitoring solutions will save you money every month, increase quality of work and help deliver potentially life-saving services for your lone workers. More important is the difference they can make. Stay tuned as we explore the Top 10 Elements for a Successful Safety Monitoring Program—and how your organization measures up, the first post in the Safety Solutions series, coming soon. Subscribe using the form on the right so you never miss a post!